2. 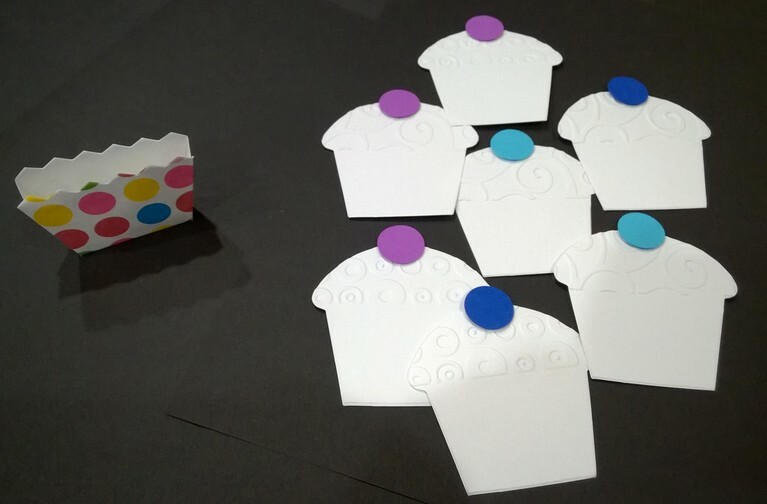 For our example, we are using a cupcake wrapper die - which has cutting blades around the outside and scoring blades to create the lines on the wrapper. 3. Begin with a folded piece of cardstock or paper. The piece of paper should be twice the size of your shape so that when it's folded, it still covers the shape completely. In our example, the cupcake wrapper is about 2 inches X 3 inches when assembled. So, we started with a piece of paper that was 8 in X 3 inches flat and 4 in X 3 in when folded. This gives us plenty of room for our "V" fold in the middle. 4. 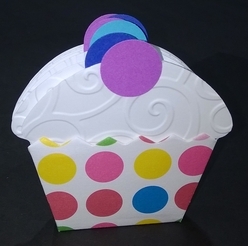 Fold the patterned paper you are using for your cupcake wrapper. For this first fold, just make sure it's in half to the 4in X 3in size. 5. Then, figure out how deep you want your pocket. For this wrapper, we decided to go with only about 1/2 inch deep. So, we folded our paper again - but only about 1/4 in from the first fold. Remember - your paper will be twice as deep when it's unfolded. 6. Unfold your patterned paper. You should see 3 score lines in the middle from your folds. 7. Refold it such that you can see a "W" when you look at the whole piece of paper folded. 8. Place the die blades up in the tray. Place the folded paper over the die with the folded edge *not quite* covering all the cutting blades. For the wrapper, we wanted to use the "flaps" that are normally part of the cupcake assembly. These flaps will become the sides to our pocket. So, we placed the folded edge not quite to the bottom of that part of the wrapper. 9. You can tell you did it correctly by looking at your leftover scrap. Notice, we have a portion of the folded edge that remained uncut. If your scrap has a perfect hole the shape of your die, you probably just ended up with two of the same shape rather than a folded card or a pocket. 10. Once we have our cupcake wrapper cut out, we unfolded it to check to see if our pocket worked. In other words, we made sure we didn't accidentally cut part of the wrapper that we needed to keep the fold intact. 11. For the assembly, we folded the flaps inward. When we did this, we noticed we had to make small cuts near the accordion fold to make sure the whole thing could assemble as our pocket. For a die or punch without flaps built in, this probably won't be necessary. 12. We glued the small green flaps at the accordion fold onto the bottom of our pocket. 13. When we folded the whole thing up, we didn't have any overlap for our flaps, so we added a small label (you could use clear tape) on the inside to hold the flaps together as our sides. 14. 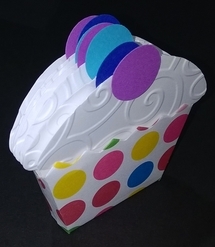 To finish it off, we made several cupcake inserts with embossed "frosting" and circle "candy" for the toppers. We were able to fit quite a few into our new pocket.